Over the years, I have traveled almost the entire 20,000 square miles of the Navajo Reservation. I have seen conditions that would make someone from a 3rd world country cringe. I have also been in many a families small one room hogans in the middle of January, when the wind chill was 50 below zero. We would stuff clothes and rags in the cracks of the Hogan walls to keep the cold howling winds out. I have seen this "extreme poverty right here on the reservations of the Southwest. When one drives into the White Apache enclave of McNary, Arizona, it is not even obvious that this is a town with almost 600 residents. The homes, if you can call them that, more resemble the aftermath of a tornado. Rickety lean-to structures and sagging shacks hit the eyes, where there is a smell of poverty in the air. The town of McNary, was at one time a small sawmill town, where there were good working class jobs, with a thriving civic pride. There was a great fire in December of 1979 resulting in mass destruction and the closing of the mill. Needless to say, within a few months the town of McNary was it's way to fast becoming a ghost town. With no employment along came the accompanying squalor. The median per capita income according to the most recent census, is less than $3,000 per year. The median age is 19 years old. I was looking at a little girl holding a doll with no head. I then saw a few boys trying to play basketball with an old rubber dodge ball on a makeshift homemade hoop. These are Apache children that must play in the street because there is no decent park or basketball court in McNary. I asked around for some insight as to why there are no decent playing facilities for the children. I was met with blank stares and shrugs. These conditions and these children are worse off than I have ever seen among our own Dine' Indigenous People. I spoke with a local Pastor of St. Anthony's, Father Peter, who expressed interest in working with us and the Apache to build a "playground of dreams" for these children. It seems to me unthinkable for these children to have to play in the dirt. My heart was truly torn as I looked out over the landscape of McNary. Please let us help them. Please give us the strength to persevere in this project. I was asked recently by an elderly Apache gentlemen (about my age) why was I, a Navajo, interested in helping the Apaches with building a playground and basketball court. I told him that the Southwest Indian Foundation was a charitable organization that worked with all the Native Peoples of the Southwest, even the small ones. I also extended my hand in friendship to a "brother" in need. We have been blessed to have good supporters like yourself. 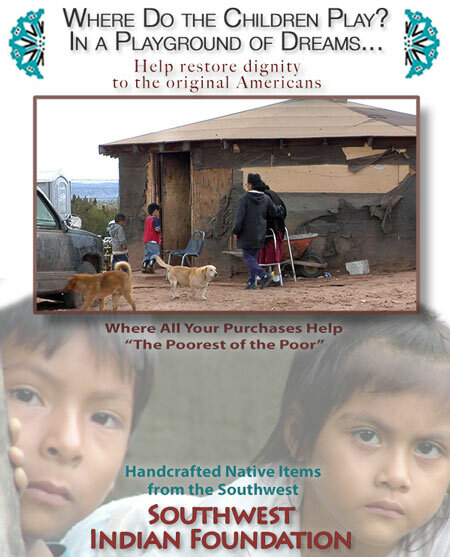 For us here at the Southwest Indian Foundation that have been the beneficiaries of that support, we have a solemn duty to share with those even more destitute than ourselves. I am working on the preliminary and necessary groundwork for the "Playground of Dreams" in McNary. I have a suitable plot of land for the site. I am working on the legal and structural preparations before we can get started. I have priced equipment and materials. I think we can do a really nice complex for under $24,000. We have a lot of volunteer labor from the local Apache community. They do not want a pure handout. They wish to contribute as much as they are able. 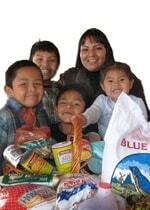 I don't thing we at the Southwest Indian Foundation get the chance to properly thank our donors as well as we should. I want to especially thank you. I also want to pledge to you that I will do everything in my power to have this Apache Playground of dreams come into reality. This is my charge. I plead for your help. I do not ask for myself, but for these precious, innocent, and almost forgotten children. Let us band together. I am so excited about the prospect of this project. Please help me. I will be keeping you informed of our progress.